Line the base of a 20 x 30cm slice pan with baking paper, allowing the paper to extend 3cm over each long side. Combine the rice bubbles and coconut in a large bowl. Place the copha or coconut oil and 180g chocolate in a heatproof bowl over a saucepan of simmering water (don’t let the bowl touch the water). Use a metal spoon to stir occasionally for 2 minutes or until smooth. Add the chocolate mixture to the rice bubble mixture and stir to combine. Spread over the base of the prepared pan, smoothing the surface. Place in the fridge for 1 hour or until set. 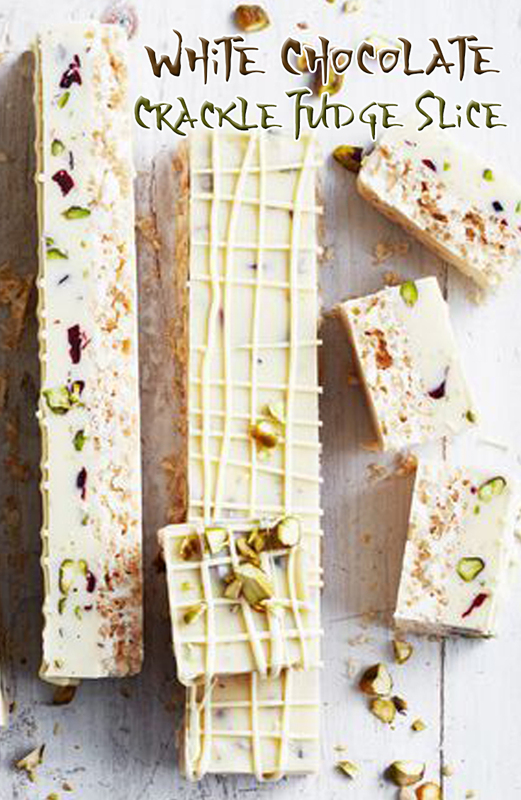 Meanwhile, make the white chocolate fudge. Place the condensed milk and chocolate in a saucepan. Melt over medium-low heat, stirring often, for 5 minutes or until smooth and combined. Stir in the butter and vanilla extract until smooth and combined. Remove the pan from the heat and stir in the pistachios and cranberries. Spread the fudge layer over the white chocolate crackle layer, smoothing the surface. Place in the fridge for 3 hours or until set. Place the remaining 100g white chocolate in a microwave-safe bowl. Microwave, uncovered, on Medium, stirring halfway, for 1 minute or until melted and smooth. Spoon the chocolate into a snap lock bag. Snip off one corner and pipe the chocolate over the slice. Place in the fridge for 30 minutes or until set. Cut into small pieces to serve.